Crocus (Crocus tommasinianus) - This is a robust perennial. 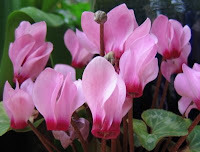 In late winter/early spring it boasts slim, goblet shaped flowers. They are available in white, lilac, red and purple. The average size is 10cm high. It is best to grow Crocus's in full view of the sun, however it will tolerate slight shade. Plant them in well drained soil that is fertile and healthy. *Top up food and water supplies for wild birds. *Firm newly planted trees and shrubs if they have been lifted by the frost. *Check that your garden tools are in working order and have a clear out to prepare for the spring.